The 2013 Passat sees the addition of an available rearview camera, as well as the new Wolfsburg trim level which resulted in a minor shuffling of features. The Passat’s rounded silhouette and sleek body lines are paired with Volkswagen’s distinctive grille to create a European mid-size sedan with American style. The base “S” trim features 16-inch steel wheels, automatic headlights and keyless entry. The Wolfsburg trim adds unique 16-inch alloy wheels. Step it up to the luxury SE trim level and get 18-inch alloy wheels, chrome exterior trim, and heated mirrors. 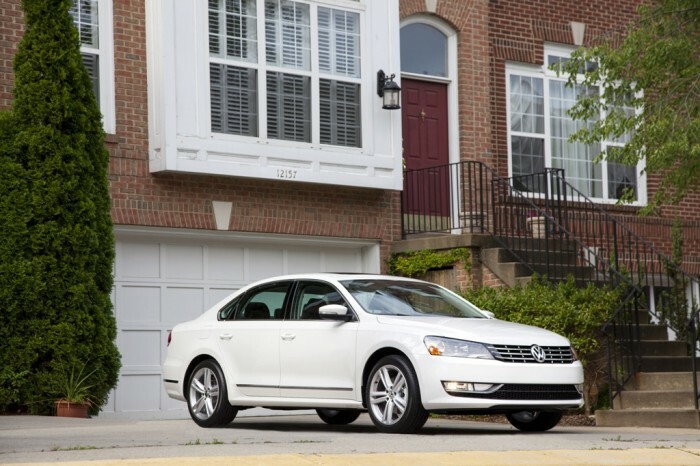 The Passat is big, but not bulky. Its exterior is refined and sensible, making this a great family car for anyone with a sense of style. The VW Passat comes with a choice of three different engines. The entry-level 2.5-liter inline-5 engine puts out 170 hp and 177 lb-ft of torque and is paired with the choice either a six-speed manual or a six-speed automatic transmission. 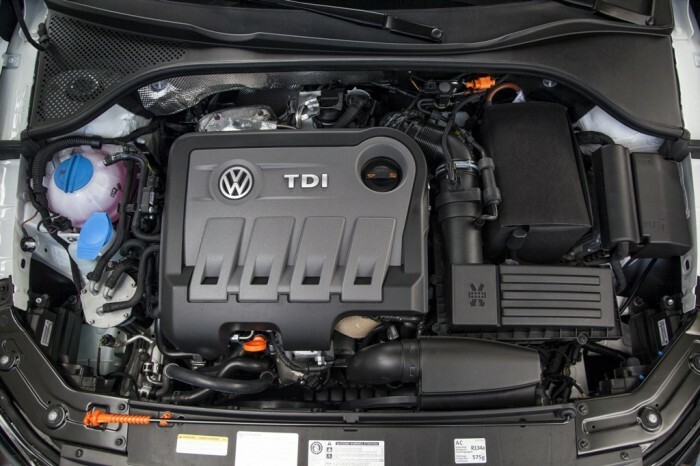 The TDI model boasts a fuel-efficient 2.0-liter four-cylinder turbodiesel that creates 140 hp and 236 lb-ft of torque. If you’re looking for serious power, choose the 3.6L which is powered by a 3.6-liter V6, capable of cranking out a massive 280 hp and 258 lb-ft of torque. Hold on to your seats folks! The 2.5-liter engine gets an EPA-estimated fuel economy of 22 mpg city, 32 mpg highway, and 26 mpg combined for the manual transmission, and 22 mpg city, 31 mpg highway, and 25 mpg combined for the automatic transmission. The TDI gets impressive fuel economy, estimated at 31 mpg city, 43 mpg highway, and 35 mpg combined for the manual and 30 mpg city, 40 mpg highway, and 34 combined with the DSG. Finally, the powerful 3.6L gets an EPA-estimated fuel economy of 20 mpg city, 28 mpg highway, and 23 mpg combined. We think a fair trade-off considering the power the sedan puts out. The Passat is incredibly generous when it comes to space. Both the front and the rear seats offer plenty of comfortable space. Interior materials are best-in-class and design feels high-end and classy. The dash is well laid-out, making it simple to navigate and control. The base Passat comes with an array of features to keep you comfortable and connected including power accessories, a six-way manual driver seat with lumbar adjustment, a tilt-and-telescoping steering wheel, steering wheel audio controls, Bluetooth with streaming audio and a six-speaker sound system with a CD player and an auxiliary audio input. The 2013 Volkswagen Passat comes standard with antilock disc brakes, traction and stability control, front side airbags and side curtain airbags. The Intelligent Crash Response automatically cuts off the fuel supply, unlocks the doors and turns on the hazard flashers in the event of a crash. The Passat received the highest possible overall rating of five stars in government crash tests and the Insurance Institute for Highway Safety rated the Passat its highest score of “Good” for frontal-offset, side-impact and roof-strength tests. There’s no denying that the Passat has been designed with safety in mind.